Joe D’Aleo quotes Russian and Australian scientist supporting the view that we are in for some prolonged cooling following the El Niño, you can read rest on his blog post HERE. La Nina and El Nino history showing that cool periods rapidly follow warm periods. Russ, is there a time window connected to when we should begin to record the lower temps? According to the Russian scientists we are on the cusp of the cooling and we will be well into it by 2020, see the updated Russian graphic. 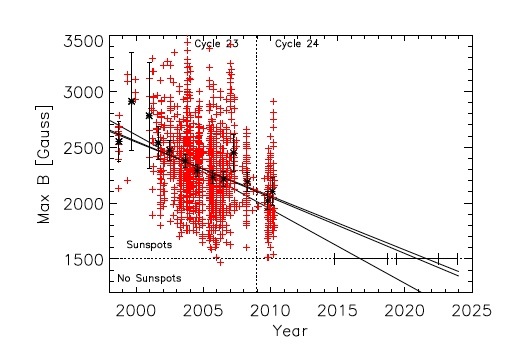 This is consistent with the Livingston and Penn research that predicted no sunspots by 2017-2020. See the Livingston and Penn graphic in the update. As you can see from the update El Niño update graphic almost every major El Niño has been followed rapidly by a deep La Niña with in two years. If the El Niño is from 2015-2016, unless we have a two years El Niño then it would be 2015-2017, with a possible deep La Niña in 2017-2018 or 2018-2019, and by then the sunspots are projected to vanish and the planet on the cusp of a little ice age. Couple this with a cool Pacific PDO and cool Atlantic AMO which is emerging, in the past this combination has produced some cold Eastern US and European winters. These cool phases are forecast to last 20-30 years. Add in the lack of sunspots starting in 2017, for 20-30 years, and things could get rather ugly. During the last little ice age, millions starved. However, we are in a better position to adapt this time, the question is will our political leaders be able to pivot from solving global warming to saving millions from starving due to the much shortened growing seasons. Spring will come later for farmers delaying planting and fall will come earlier with damaging winds, rain and snow. Life is going to become more difficult for farmers over the next 20-30 years. So why do I think the war on livestock is crazy? 1. Because not all land is suitable for crops. Hilly land, rocky land and land that has been worn out is much more suited to livestock/hay. 2. Silage — If the weather turns iffy converting you unripened grain into silage is a really good idea. 3. There are winter crops and grasses that are not affected by intermittent snow cover and can provide forage in spring and fall. One person I know in Virgina ‘Stockpiles’ fescue grass for the winter and never provides hay for her horses. They eat pasture all year round even when it is snow covered. Before that Brazil’s JBS (José Batista) bought Swift, Pilgrim’s Pride, Five Rivers Cattle Feeding LLC and also U.S.-based National Beef Packing making it the world’s larges meat packers. I wonder just how much of America’s farmland is still in the hands of individual American farmers and not international corporations (or under contract to those corporations)? Good quantitative answer Russ. We should get some pretty strong verification within the next 5 years. Hopefully the politicos will not do too much damage between now and then. Thanks Russ. Stefan, with all due respect I think you are wrong. How do you explain the snowball earth ‘Sturtian Glaciation’ of the remote geological past, and then reconcile that with the hottest periods of Earth’s history when there was no glaciation to speak of, and no polar ice caps? The only way any rational person can explain those extremes is that the overall averaged temperature of Earth was colder, in the case of Snowball Earth, and much warmer averaged OVERALL than today during thermal maximums. It is simply not possible that those two extremes, if globally averaged separately from each other, would come up with the same global averaged temperature. That’s not going to happen. Also, I saw on your very wordy site(you should really try to be more concise, you might get more comments), that you make the erroneous claim that ‘CO2 absorbs cold’ and that’s ‘why it is used to make dry ice.’ Gases or any material for that matter cannot ‘absorb cold’, but they can be heated and, lose heat through radiative emission. Gases require chilling and pressurizing in order to change state from a gas to a solid or liquid. I think you need to brush up on your understanding of thermodynamics. BUT: you would be tough on me – to pick on any legitimate mistake – and I can rub the Warmist noses that: I have ”peer reviewed post” On that second post, about Venus – you’ll see lots of talk about dry ice and liquid CO2. Andrew, just spotted your comment: you asking me ”to explain past global warmings / coolings” is same as asking me ”why and how the sun is orbiting around the earth” Andrew, established ”beliefs” are wrong, but, here: -”in the past the polar caps were on many different places – so: when they found warmer than now to some place -> was declared as ”warmer the whole planet” or cloder. They didn’t know that ”overall” global temp self adjust itself and they accumulated lots of crap for uni books. #2: technically gas loses heat / gains heat, BUT: also technically san say that gas gets or loses coldness= technically you are splitting hair! Russ, Something to note, we did not reach back up to the kind of temperatures the earth had when the Vikings were living in Green Land back in the 1000 AD – 1400 AD time before the little ice age happened. Therefore cooling maybe more on a downward spiral quickly this time around. My worst case scenario is we could be back into Dalton Minimum temperatures by the end of solar cycle 24 and, if solar cycle 25 is weaker than 24 it may turn out that cooling will be at the Maunder Minimum levels as far as the temperatures around the planet. I hope I’m wrong about this, but it can happen if you do the math. ‘Little Ice Age” was concocted by an American Warmist professor; from a photo showing people scatting on river Thames, because a freak weather frizzed the river for few days; then Plimer adopted it in his book,for the skeptics (same as for Vikings on Greenland – they didn’t say that: at SAME TIME Vikings were in Sicily for 100y – their “globe was cooler”, reason they were on Mediterranean climate…?!. Only 3y ago Danube was frozen -1000miles closer to the equator than Thames / 10 times larger river AND 100000000 of photos were made – why you ”anything believers” didn’t declare it as ”Midi Ice Age” for 600 years?! One can conclude we are living in an unusual time in climate history, a warm moist period, when the long term average is much cooler and dryer. Dear me. I suggest you read Brian Fagan’s “The Little Ice Age: How Climate Made History 1300-1850”. In US you have different reasons, but similar problems: high evaporation in the gulf- Texas was rainforest and was sending moisture west. Opening Gibraltar 10000y ago and french Chanel made water as soon as warmed – goes east by the gulf stream – as on conveyor belt / no time to produce WV there. ; opening Bosporus speed it up. collapse of Texas vegetation, swamps -> no moisture going west-> created Nevada, Dakota, Arizona semi-deserts-> ”that dry heat” is going in every direction and kills the vegetation and moisture in most of US (your shonky experts are blaming Maya people for irrigating, destroyed vegetation and sunspots; how sick!) Irrigation improves climate- if they didn’t irrigate, wouldn’t have put one brick, to close Gibraltar! SAME as when people didn’t know about bacteria – they were burning witches, to prevent sicknesses (I don’t know if you waste lots of storm-water without dams / Australia, smallest continent, surrounded by the biggest mas of water on the planet, is the driest continent – because the shonks climatologist and similar, are the biggest white color criminals; everybody censors or silences the truth from me; because both camps are into fundamentalism…! Q: Russ, is the climate perfect now?! Q: Why everybody is a ”Climate from Changing Stopper?! WHAT WE NEED?! WE NEED CLIMATE CHANGE! WHEN DO WE NEED IT?! NOW!!! Stefan, A large part of the centre of Australia is 32 ft below sea level, it has been my dream for fifty years that a channel be dug from the gulf country. That would create an inland sea, the gulf has 20ft tides, you would be able to surf the tidal waves all the way to the centre. That inland sea would green a huge amount of Australia. Wayne. Wayne; as long as you keep the knowledge that ”water regulates climate” – you cannot become a ”collateral damage” = your truth will win on the end – because the truth always wins!!! Warmist and ”climate skeptics” ignore inland australian climate = reason they are ”climate from changing stoppers” Wayne; some people just cannot get hipnotized, you are one of those! keep up the great work!!! jeremyp99 says: ”Dear me. 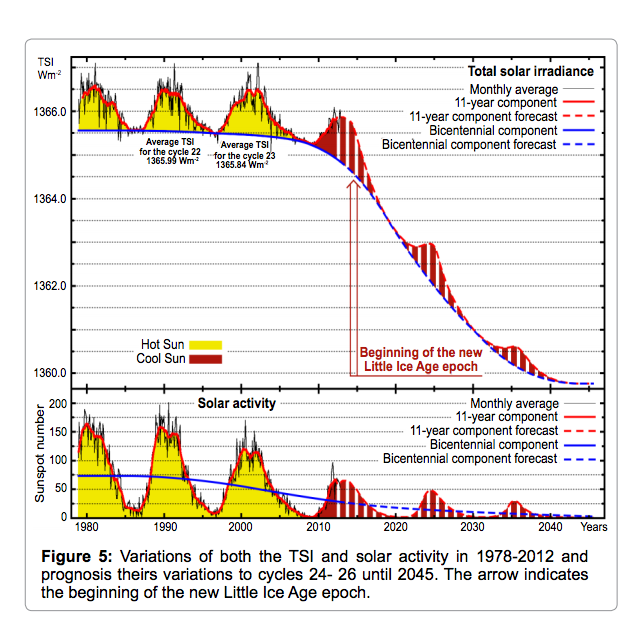 I suggest you read Brian Fagan’s “The Little Ice Age: How Climate Made History 1300-1850″. Hi jeremy, when swindlers write something – they exaggerate, to sell his book. IF he said: freak weather extremes happened, same as today; but most of the year was normal weather /on most of the places / the planet is a big place -> people don’t buy the book;, because the truth is boring! If that Fagan is telling you that: he knows the exact dally temp for 1350 in Australia, Africa, America, Antarctic and all the water in between; before Colombo and Cook discovered them – he is telling you that: he is a entertainer / swindler/ liar. They are the precursor of today’s evil and robberies, by using CO2… SAME swindlers are exaggerating about today’s temp on desolated places, your Fagan had easier job lying; because he was lying about the distant past! On my first comment above is a link, will tell you why the Warmist are winning – because of the past voo-doo science that ”skeptics” use. please read that post, broaden your knowledge. They want to pipe oil from Alaska and Canada to Texas beaches BUT: if they pipe half of the water from Mississippi river west into the semi-deserts, can reverse and improve the climate in most of US!!! Killing the dry heat created in those deserts -> will attract regular clouds inland = water makes water, as money in the bank. Blaming CO2, sunspots, witches; – you must sacrifice three virgins every year – if you are lucky to find one, in the whole of US… good luck! Anasazi America: Seventeen Centuries on the Road from Center Place, by David E. Stuart a professor at the University of New Mexico. The author looks a life in the desert south west and the impact of climate change, long before we CO2 was an issue. I also suggest that you read The West With Out Water. Again, another academic look at the impact of climate change in the south western US, including California. You will become to appreciate the climate cycles experienced by the region and the impact on the people living there. The earth experiences long term climate cycles, that humans have little control over. While humans argue over whether the planet is warming or cooling, our bodies, food, water, and air are under extreme assault. Hi Russ; I’ve read few similar books, I’m not talking from the top of my head. Floods and droughts are natural phenomena – Gondwanaland was the biggest desert ever – because was a big landmass and most parts far from the sea. Has being going up and down since, for many reasons. Studying alluvial deposits can give ruff idea, BUT: because they all had a wrong starting point and presumption, that global temp goes up and down = they are all wrong! Is never summer on the ”whole” planet, or winter – it goes as kids ”see-saw plank” – the hotter one place goes, simultaneously colder other places go; it’s laws of physics! Whatever those laws don’t approve – it was MANY different reasons for those things happening! You know US topography, I don’t, BUT: giving you examples/ real reasons – example Colorado canyon: it shows bigger gravel deposits at some time, other times only fine dirt; and ”repeats many times” / CYCLES, BUT: that only tells about the rainfall on the hills upstream, not even for state of Colorado! Definitely not about Africa, Australia or Russia and all the water in-between! Declaring localized events as ”global” is the precursor of all confusions and rip-off! …There seems to be more active volcanos when the sun is quiet, but I cannot find any specific studies…..
Gail, That is my sense as well, but it has been hard to find some hard numbers. Thanks for the link. I like Jo Nova’s blog and have promoted her books on my blogs.